2. Hit the Start button. The program then commences in full screen mode. 3. 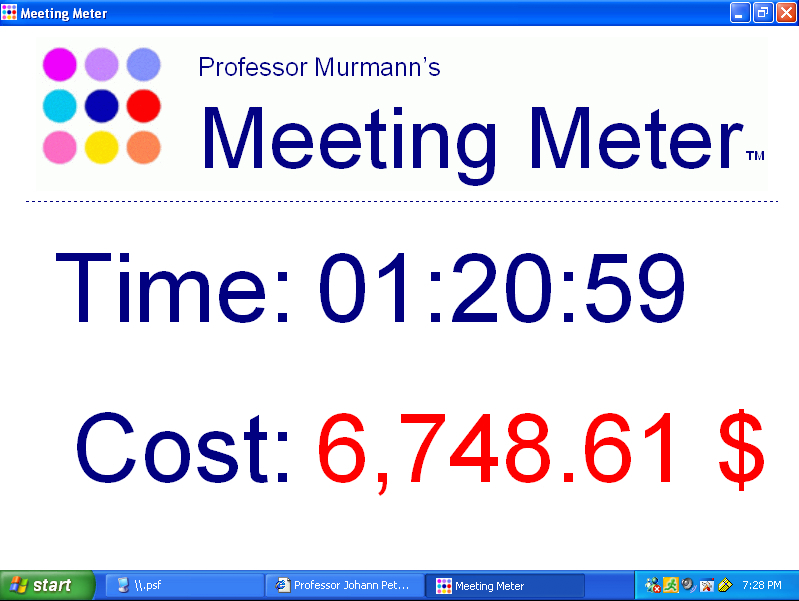 To work with other programs and to turn the Meeting Meter™ into a small window, click on the small window icon in the top right corner of the screen, left to the red X. 4. To time the agenda of a meeting, you need to click on the Agenda tab of the program control window. This will bring up a window into which you can enter several numerically ordered agenda items as well as the time budget in for each item. 5. The program automatically starts timing the first agenda item. To switch the timer to the desired item, you move with the mouse over the second or later agenda item. 6. To work with other programs and turn the Meeting Meter agenda display into small window, click on the small window icon in the top right corner of the screen, left to the red x. 1. Why is there a registration requirement after 24 hours? The second reason for registration requirement is that we can notify every user when an update of the program becomes available. 2. Is there a danger that the program might bring a virus onto my PC. No. The program was certified to be virus free by CleanSoft. The link a the top of the page will allow you to download a secure program. 2. Is there a version for the iPhone?